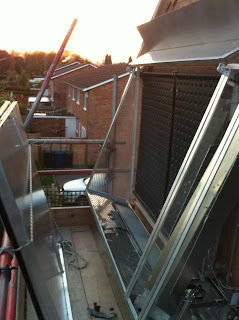 5 April 2012: Work has started on the repair of the Sunbox system. The scaffolding that was used for the Varisols has been moved to the south wall of the house. The only way to tackle this is to get up there and get in. Well the fronts have all been taken off, and I was somewhat surprised at how well it was built - in that it takes some getting off to remove parts! 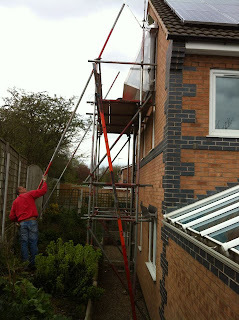 so many flashings that have now glued well and truly, and have to be cut to get them off. Perhaps I should put things back so that it is all more disassemblable, a bit like the fairing on a motorbike. Here is a close up of the leak. 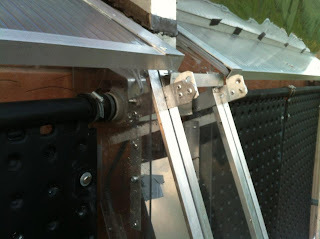 It is not leaking from the panels, which is a great relief. Its leaking from one of the joints in the 40mm plastic piping, which is a replaceable part, I hope. (PS apologies for the slightly messy hinge detail, I kept having to modify it slightly to get the front to fit tightly.) I'm not sure how long it is all going to take. Starting something on the Thursday is a bit risky as some suppliers etc will be on holiday until well into next week.